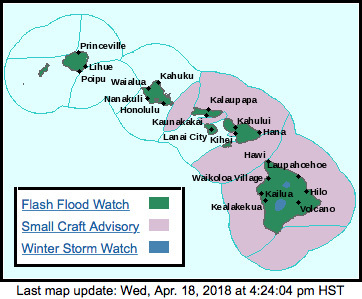 The National Weather Service in Honolulu has issued a Flash Flood Watch for the entire state of Hawaii from Thursday morning (April 19) through Friday afternoon. Deep moisture associated with an old frontal boundary lingering across the state in combination with an upper-level trough moving through the area, will bring the threat for heavy rainfall and flash flooding. The heaviest rainfall is expected to fall from Oahu eastward to the Big Island. Even though widespread heavy rainfall is not expected on Kauai, many areas have recently received a significant amount of rainfall and the soils remain saturated. As a result, even moderate rain falling for an extended period in these harder hit areas of Kauai could lead to Flash Flooding. A Winter Storm Watch will be in effect from Thursday morning (April 19) through Friday afternoon for Hawaii Island summits above 12,000 feet. Heavy snow is possible with accumulations of 6-12 inches being possible. Roads to the summits may rapidly become snow covered and slippery, resulting in difficult travel conditions. Significant reductions in visibility are also possible. A Small Craft Advisory is in effect until 6 a.m. Thursday (April 19) for the Kaiwi Channel, Maui County windward waters, Maalaea Bay, the Pailolo and Alenuihaha Channels, Hawaii Island windward, leeward and southeast waters. East winds of 15-25 knots and seas 7-10 feet are forecast.